The British actor was born on the 26th of May 1913 in Kenley, Surrey. He was directed towards acting by his aunt who was a stage actress. Peter was talented in drawing, and it proved very useful because his first job was the assistant of a government surveyor. He appeared on the stage of local theaters, then he attended the Guildhall School of Music and Drama in London. In 1939 he tried his luck in Hollywood, but returned to England after a short period of time. He acted in theaters and appeared in several television shows. In 1957 he became the star of Hammer Film Productions and shot many horror movies in the following 20 years. He lost his beloved wife Helen in 1971 and this tragedy affected him deeply. He told in many interviews that one thing keeps him going, and it is the hope that they will meet again one day. He retired from acting in 1986 and wrote two autobiographies. His favourite hobbies were painting and watching birds. Observing birds was a favourite pastime of the real-life model of Sherlock Holmes, Dr. Joseph Bell. In the Canon Holmes loves birds too. Cushing was a kind and good-hearted man who loved animals just like Jeremy Brett. In 1989, he was made an Officer of the Order of the British Empire in recognition of his contributions to the acting profession in Britain and worldwide. Peter Cushing died on the 11th of August 1994 in Canterbury, Kent. 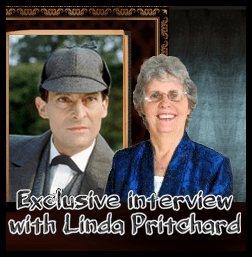 The actor was a huge fan of Sherlock Holmes since he was a child. He also owned a collection of The Strand Magazine. He portrayed the legendary sleuth in two movies and one series. Hammer Productions decided to make an adaptation of maybe the most well-known adventure. They chose Cushing because he starred in countless horror films made by them. He shared many characteristics with the detective: he was tall, his gaze was steely, had gaunt features and his speech was precise. As an avid Holmes fan he always stressed the importance of going back to the source – that is, the Canon of Conan Doyle. His Watson was played by André Morell, who did not want the character to be comical. Sir Henry was portrayed by Cushing’s friend Christopher Lee, another veteran of Hammer Productions. Only little bits of the story had been changed for being more dramatic and for having some horror elements on the events (in this case this element was a tarantula). Both the sets and the costumes were of the highest quality. The only problem was in the hound itself: the dog was too friendly and good-natured. To make the animal look bigger the studio hired children who were dressed like Holmes and Sir Henry, and the sets were made to match their height. Sadly the movie did not prove so successful as the producers hoped and critics were not too enthusiastic about it either. But since then opinions changed and Hammer’s Hound is regarded as one of the best adaptations of the story. As it brought not too much money for the company, Hammer decided not to make more Holmes movies. Royal Mail issued a stamp commemorating the centenary of Peter Cushing’s birth in 2013. It belongs to the Great Britons set and was made using a scene from the movie. The BBC series consisted of sixteen 50-minute-long episodes. Its antecedent was a series shot between 1964 and 1965 starring Douglas Wilmer as Holmes, Nigel Stock as Watson and Enid Lindsey as Mrs. Hudson. During shooting Wilmer had many quarrels with the producer because of the inaccuracies of the scripts and because of the fact that he had much less time to learn his part as the promised three weeks. Sometimes he wrote the whole script again. At its first airing the series produced average ratings. When it was aired again after a year, at a much luckier time, it made into the top ten programmes. Seeing this BBC wanted to continue the series with a new season. The only problem was that they had to find a new Holmes for Stock’s Watson, because at that time Wilmer was shooting the Fu Man Chu series in Hong Kong and was unavailable. The role was offered to John Neville and Eric Porter among others, but none of them accepted it. Then the producers asked Cushing to take the part, who had lots of jobs though in poor quality films. So he was happy to play Sherlock again. It was planned to have such leading names among the guest stars like Peter Ustinov, Sean Connery, George Sanders or Orson Welles – but unfortunately these plans did not materialize. The series had a new Mrs. Hudson, she was Grace Arnold. The series was extremely popular and received awards in Italy and Hong Kong as well. Another interesting fact is that Cushing played not only Holmes, but his creator, Sir Arthur Conan Doyle as well – he appeared as the author in the 1976 movie The Great Houdini. This Tyburn Films production was set in 1913. Watson was played by John Mills. Cushing was already semi-retired when he agreed to play the sleuth again, as he was 71 years old. He feared not to be energetic enough and he did not want to disappoint anybody. Shooting was organized in a manner that allowed him the maximum rest between takes. Critics say this was maybe his best Sherlock performance. Tyburn Films planned to shoot another Sherlock film entitled The Abbot’s Cry, but while Mills was ready for filming, Cushing refused the role. The producers asked Ian Richardson to be Holmes, and him and Cushing had a talk about the part, but filming had been cancelled. 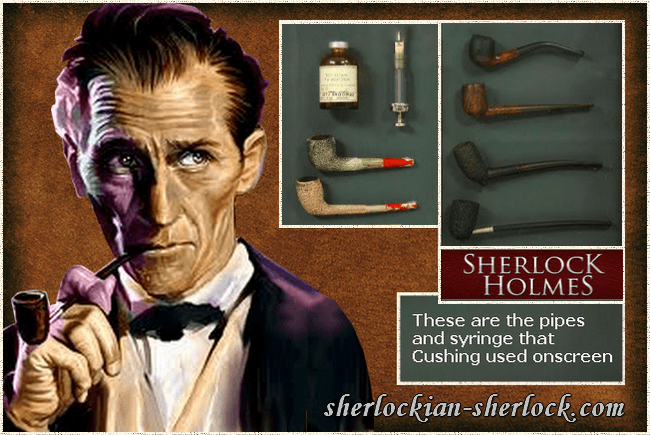 Cushing had a keen interest in Holmes till his death in 1994. At the end of the 1980s he became the first Honorary Member of The Northern Musgraves Sherlock Holmes Society. He even made a sketch of Sherlock what the society used as its logo.